Wait for your download to finish and launch the file if you saved it. Follow the on-screen installation instructions. After installing, double click on the desktop icon for eMachineShop. 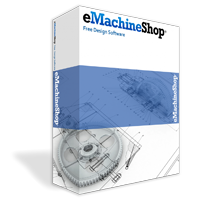 To upgrade to the most current version of eMachineShop’s free CAD software, simply download the current version above. To troubleshoot downloading, view our "> ">Downloading FAQ’s, Version History, or Contact Us. Utilize the Software’s Video Tutorials, Online Manual & Frequently Asked Questions.